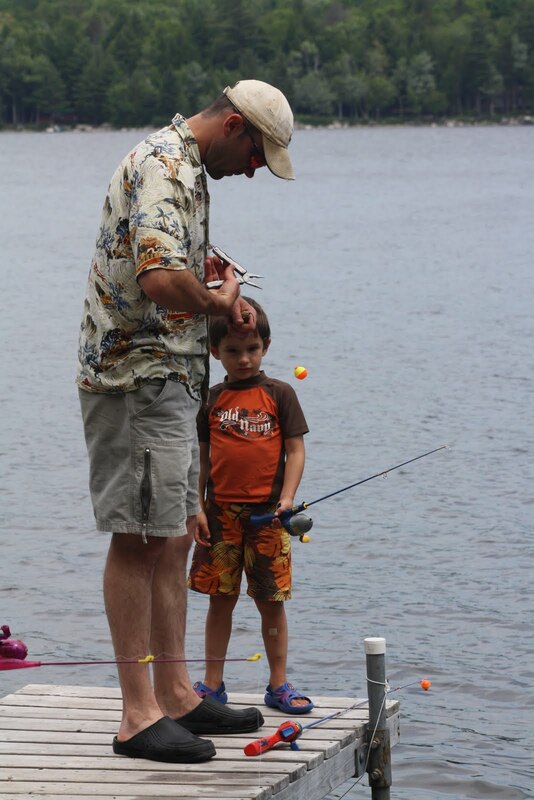 The Maine Outdoorsman: Hook Kids Into Fishing - What if We Catch Something! Hook Kids Into Fishing - What if We Catch Something! Fish long enough and eventually your child will catch a fish. It will likely happen at the most inopportune moment, like when your dog has become hopelessly tangled in your youngster’s fishing line, the reel breaks or someone is attempting to take a pee. So, when the unexpected occurs do not be alarmed but accept it for what it is, after all this is fishing and one must learn to relax and roll with the punches. As your child busies themselves reeling in their prize, your heart will be racing and you will no doubt forget to pull out your camera! This would be a MISTAKE OF TITANIC PROPORTIONS! Make sure to have your camera handy at all times when fishing with your kiddos, for it will be the moment that you forget the camera or fail to take a photo when the most amazing and memorable events will occur. So after a great struggle, you finally manage to haul this massive aquatic beast onto the dock, your kid is smiling like a Cheshire cat and you are flailing around trying to take a couple of good photographs, before the fish throws the hook and returns to the depths. It is important in this instance to remain calm. Yes, I know you are excited and caught up in the moment but it is also important that you remember that some fish are equipped with spines and teeth. In some cases, these fish species can inflict serious injury to you or your child. This should all have been explained to your child BEFORE they catch their first fish or when you catch one and they are shown. If you did not follow this advice, do not be surprised if you get a frantic, “Arrrgh, Daddy! FISH HAVE TEETH!” followed by your little one stomping on said fish’s head and kicking it back into the water. Another decision you will want to make before the first catch is your stance on catch and release. Are your plans to keep, kill and eat the fish or throw it back for whence it came? In my opinion both plans have merit. To keep, kill and eat a fish is a great opportunity to teach youngsters how to quickly and humanely kill game, where food comes from (not Styrofoam packages at the grocery store!! ), and how to properly clean and cook a fish. Letting the fish go, teaches conservation, preservation, moderation and a bunch of other words ending in –tion. REMEMBER, fish and game laws may not allow you to keep your child's first fish so make sure to read your law book before heading out. "and a bunch of other words ending in 'tion'"......classic! nice post. my little guy has been out with me as i've (sort of tried to) fish(ed) with him running around and hucking rocks in the water, and he's def. interested in the fishing rod. We'll see where it takes us! Thanks! Its all a series of steps that slowly build on one another until in a short time later they are out fishing you!